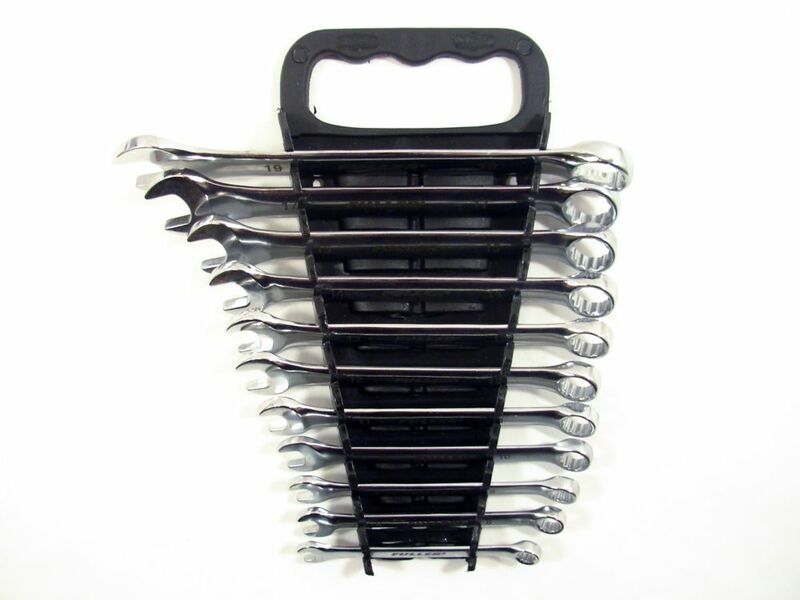 When it comes to combination wrenches, this 11-piece metric set has everything a professional expects: 11 of the most-often used sizes, chrome-vanadium steel construction for strength, heat-treated materials for hardness, a 12-point box end for exact fit, thin-walled construction for ease of use in tight spots, and full chrome polish finish for a professional look and feel. If you're looking for a quality ratcheting wrench set for your home workbench or toolbox, this 5-piece metric set delivers everything you need: engineered to exactly fit standard metric-size nuts and bolts, and featuring a mirror-like polished chrome plating that resists rust and grime, these tough chrome-molybdenum steel tools will give you years of trouble-free service. Performance is engineered into every one of these wrenches: from the chrome-molybdenum steel that makes them tough as nails, to the two-way ratcheting mechanism that makes any job go faster, this 5-piece wrench set is the perfect combination of durability, versatility and value for the money. Pro Series Metric Combination Wrench Set (11-Piece) When it comes to combination wrenches, this 11-piece metric set has everything a professional expects: 11 of the most-often used sizes, chrome-vanadium steel construction for strength, heat-treated materials for hardness, a 12-point box end for exact fit, thin-walled construction for ease of use in tight spots, and full chrome polish finish for a professional look and feel.